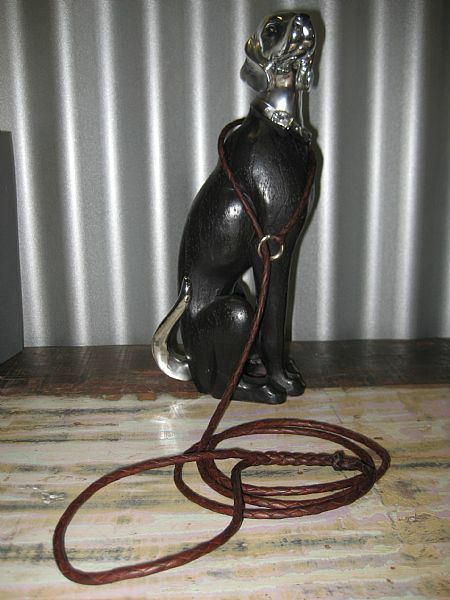 I use only the best kangaroo leather available in Australia, It is hand cut to a specific width for plaiting. I hand plait four strand together ending up with a highly plait, yet exceptional strong lead or collar. Our colours are black, brown or white. I also do leather dog lead, dog collars and tracking harness' that are cut,and sewn by myself, I use English bridle or Itailian leather. The benefit of using the age-old method of sewing by means of twin needles, that should one of the stitches ever break, it doesn't run, unlike machine stitched articles. Each leather article is lovingly hand stitched or hand plaited by myself, ensuring you get the finest quality, strength and finish. 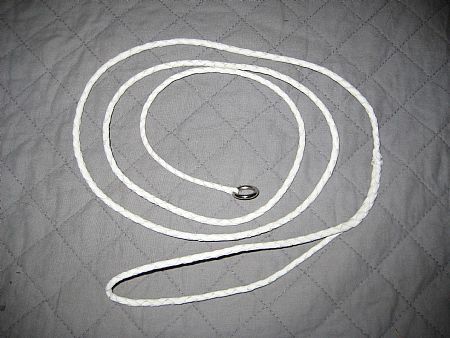 We also have tracking , walking leads made of Beta Biothane material. Looks like leather , very durable. Just needs a wipe with a damp cloth.